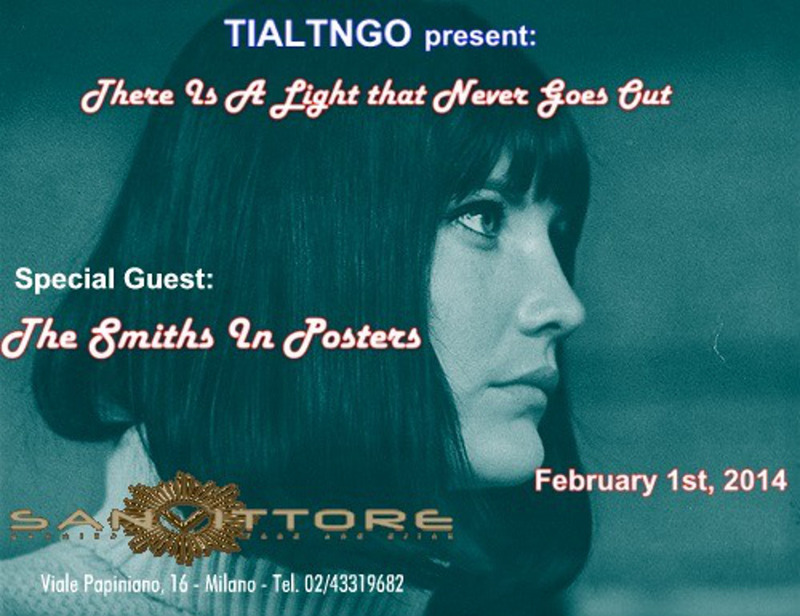 ‘There Is A Light That Never Goes Out’ Facebook group or commonly known as TIALTNGO have promoted the Exhibition of the first complete collection of The Smiths promotional posters, distributed as a limited edition in record stores at the time by the independent record label ROUGH TRADE. Other ones are also included from the American partner label SIRE. The posters form part of the personal collection of a true Smiths’ lover and an Indie music DJ, Marc Capella. The Value of the collection is priceless* and is the fruit over a decade of careful research. *Nov 24th 2008 Christie’s NY Art gallery sold The Smiths first LP poster for a $563 bid. The Smiths released their first single in May 1983 and broke up 4 years later in the summer of 1987. The expenses of the event (transport, insurance…) are being funded by private people* & by TIALTNGO. *So far: Umberto Picchiotti (It. ), Christèle Mercier (Fr. ), Mags & Guy Burke (UK), Ian Lord, Madchester FB Page (UK), Andrea Patrucco(It. ), Stephen Dickson (UK), Nick & Judi Stavropoulos (ILL., US), Maribelle Alcántara (Esp.) & Riccardo Strano (It. ), Graham Chard (UK), Bieno Martí (ES) Anne-Marie Meunier (CA), Sümer Cansever (TK), Sara Johansen (NW), Mercè Martí(CAT) &Montse Masdeu(CAT) . The 1st day of the exhibition, 1st February, TIALTNGO group holds a Party from 20:00h to 3:00h. 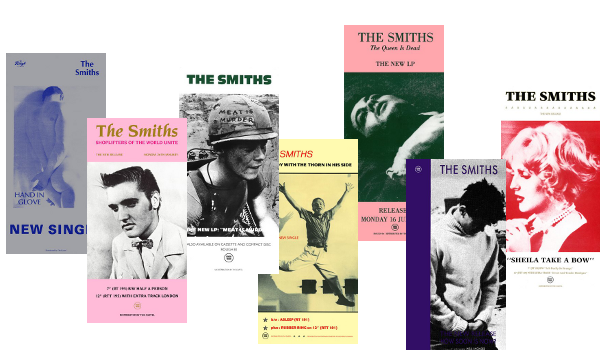 The sleeves of The Smiths discs, illustrated in the posters, refer to the world of cinema, literature or music: including the appearance of icons such as James Dean, Alain Delon, Truman Capote, Terence Stamp, Shelagh Delaney or Elvis Presley. 3. What Difference Does it Make? 11. How Soon Is Now? Restaurant San Vittore is located in Viale Papiniano, 12 in the center of Milan. The Smiths was one of the most prolific bands in the history of music during the time they were together, from 1982 to early summer 1987. The band was led by the song writing partnership of Morrissey and Johnny Marr, and was signed up to the independent record label, Rough Trade Records. Together with other independent labels across the UK, Rough Trade set up a distribution network called “The Cartel” to provide better access for their bands to the record market in the face of the powerful “major” distributors (EMI, Warner, etc…). At that time, the group was particularly notorious and revolutionary for two reasons: the profound lyrics by Morrissey (unusual, poetic, poignant, ironic and controversial) and the musical composition by Marr, which brought the guitar back into centre stage in the charts. Following the punk years of the 70s, the emergence of The Smiths in Great Britain was like the eruption of a volcano at the epicentre of the post-punk era, with stinging lyrics and the presence of flowers (chrysanthemums and gladioli) in any public appearance of the band. The Smiths albums are found in most top 100 discs of all time, particularly “The Queen is Dead”. The British magazine NME published in April of 2002 the results of a survey of « The most influential band in Britain in the last 50 years ». Specially thanks to Ian Lord, for being such a nice and trusty person, Sabrina Cipriani for helping me with the shipping of the posters, costs, deals… and to TIALTNGO group members, first for asking me to get the collection to Italy, for helping out with the installation and dealing with the restaurant and in the end for funding the money lacking to cover the overall expenses of the exhibition. Marc Capella would like to thanks to Jordi Domingo. I hope my dream reaches you. I still remember, as if it was only yesterday, the Sunday evenings of 1989-90 when you and my brother Jordi took me to La Cage while on our way to it by car you discover us the unknown The Stone Roses. He would like to dedicate this to all those who believe that dreams DO come true, for otherwise they are not dreams. For the rest, regrettably majority, the Nightmare on Elm Street saga.